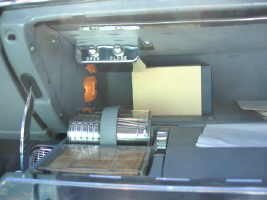 Both the front glove compartment and the rear seat armrest were equipped with appropriate sashes and pockets to receive the personal items. 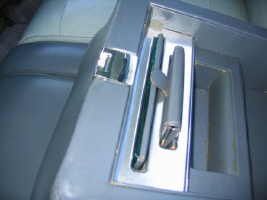 The various slots in the glove compartment door were covered by a second lid which served both as a mirror, when it was opened to the half-way position, and as a tray to support the drinking cups when it was folded out fully. Here are full descriptions of each of the vanity items and personal accessories which I had the rare opportunity to view in Detroit, in the Fall of 1994. They belong to Brougham #210, owned by Alan Haas, President of the national Cadillac-LaSalle Club. Alan kindly allowed me to photograph these items in the Cadillac refectory at Warren, MI. 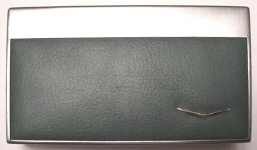 By far the most intricate and varied of the the "personal accessories" was the vanity case, inserted in a slot in the right side of the glove compartment lid. 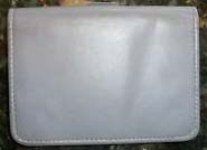 This specialty item is believed to have been made by Evans, USA, a well-known manufacturer of fine purses and compacts since the twenties. 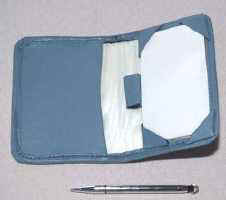 A beige-colored soft flannel cover was provided to protect its leather covering in case Madame decided to place it in her handbag to attend the theatre or another social function. 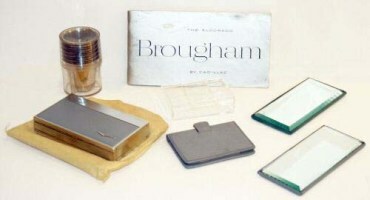 1 Enthusiast Rick Zeiger, believes that original Broughams came with stick cologne; he founds his opinion on the description of the Brougham glove box included in the factory's own annual Data Book(s) for both 1957 and 1958; there, it is clearly stated that The glove compartment is custom fitted with cigarette case, tissue dispenser, vanity compact and lipstick, stick cologne, etc... Rick quotes additionally from the rare Eldorado Brougham press kit dated November 28, 1956: The door of the glove box will be custom fitted with a cigarette case, tissue dispenser, vanity compact and lipstick, stick cologne, etc. ; so the question remains open; to give credence to Rick's belief we need to find a surviving Brougham that still has its stick cologne. Personally, in the 45 years I've studied the Brougham and examined very closely a few of them, I've never come across one with this accessory. It should be noted that the leather covering on the vanity case could be matched to the Brougham's upholstery, as could the padded back on the mirror and the leather note-pad for the rear seat passengers. 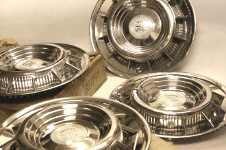 The colors said to be available were black, white, blue, light gray, dark gray, green and beige; however, only four of these colors are listed in the "Eldorado Brougham Parts List" [these are gray, blue, green and beige]. 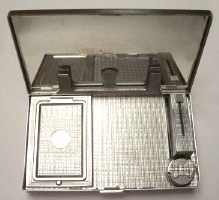 Raising the obverse lid, with the Cadillac "V" in the lower right-hand corner of the leather covering revealed the powder compact, the clear plastic comb in a special slotted holder, the metallic lipstick holder and the special spring-loaded tubular holder for loose coins. 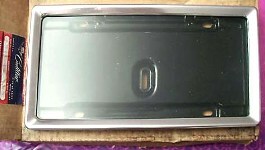 The inner part of the lid served also as a mirror. 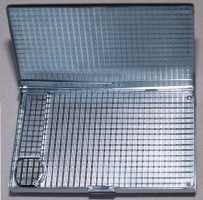 The vanity case could be re-ordered from the factory, like an ordinary spare part - and presumably with all the contents. It is listed as being available in gray, blue, green and beige. Dont bother trying to order one for your car; the stock is definitively depleted! Sometimes "stick Cologne" is mentioned as one of the prestigious personal accessories. 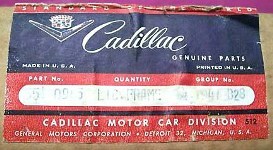 There was no such thing, even though it is listed (obviously in error) in the Cadillac Data Book and other merchandising texts published in 1956 and 1957. 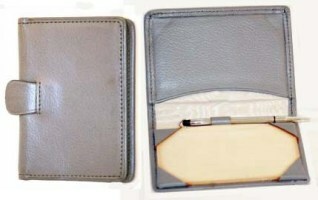 I have seen some similar Evans "carry-all" compacts for sale at flea markets. They are the same size [5 ½ x 3 1/8 x 1 inch] but usually are fitted with a carry handle or shoulder chain; some have rhinestone decorations and gold or enamel finish. At considerable effort, I guess some of these could be modified to depict the authentic Brougham item. Flea-market prices for the latter ranged from $50-100 in the late nineties. 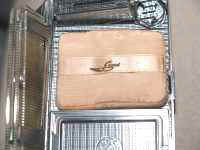 On the other hand, an authentic vanity case for the Eldorado Broughams of 1957-58 may run you hundreds or even a couple of thousand dollars. In January, 2003, one of these was offered for sale on e-Bay, the electronic auction site. The starting bid was shown as 99 cents or you could "buy it now"...for $2500!!! Final sale price was, nonetheless, $1525 ! January, 2003 (on e-Bay): "Buy it now" ...for just $2500 !!! and the comb) sold on Ebay in May 2008 ...for $6,600 !!! 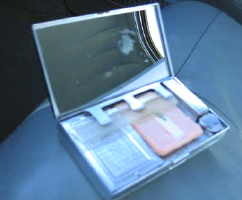 Interestingly, the same vanity case was used in a customized Oldsmobile Holiday show car in 1957. In the photo below we see Ms Peggy Sauer holding the compact in her right hand. She has taken it out of the glove box. I have not been able to determine if the Brougham was the first GM model to have that vanity item. 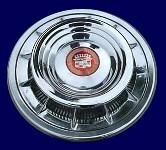 In any case, only the production Eldorado Brougham models included it as standard equipment and even showed it in the Master Parts List (MPL). 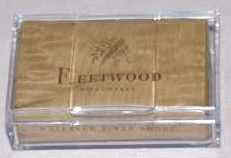 Note that Peggy Sauer was one of harley Earl's "Damsels of Design"
cigarettes are the "Fleetwood" brand. 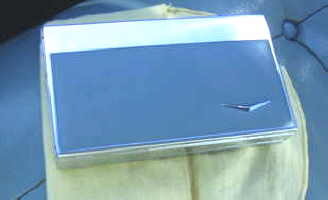 A plastic cigarette box, large enough to hold a standard pack of 20, slid into the forward slot on the left-hand side of the glove compartment lid. This accessory could be re-ordered from the factory [part # 469 2815]. 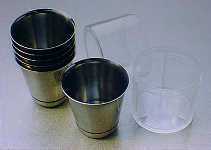 Cups: dia. 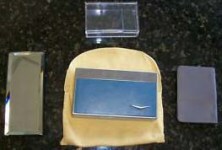 2 1/8" (top), 1¼" (bottom), height 2 1/8"
gray notepad and cigarette box sold for a few bucks short of $5,400! 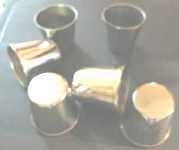 Six silver-colored metallic drinking tumblers were stacked and stored in a cylindrical plastic holder. 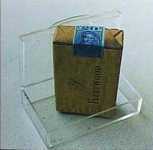 The latter holder had its own storage compartment directly behind the slot for the plastic cigarette case. 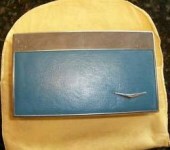 A leather strap and snap-fastener held it in position while the car was in motion. 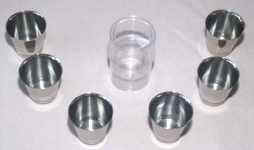 Each of the goblets or tumblers had a magnetic base so that it would stay in position when placed on the metallic tray or inner lid of the glove compartment. 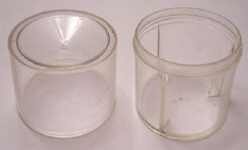 The lower part of the tumblers, below the ring noticeable at the base, contained the magnet. The plastic holder for the tumblers opened up in the middle. The lower part had three braces (not visible in the illustrations) to prevent the tumblers from rattling when the car was under way. This accessory too could be re-ordered from the factory [part # 471 9580]. Reproduction sets are currently  available. It is not easy to distinguish them from the originals. 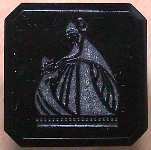 Dimensions 3½" long, dia. ¼"
This also from another Brougham aficionado, Lance Hirsch] By the way, Brock Peters was not the chauffeur in the movie, "Driving Miss Daisy". That part was played by Morgan Freeman. Brock Peters played Tom Robinson in To Kill A Mockingbird. I'm not sure how popular that book and movie was overseas, but if you haven't seen or read it, do it! The book won the Pulitzer prize and Gregory Peck won an Oscar. Brock Peters was also in one or more Star Trek movies among many others. Crafted in leather, to match the car's upholstery and with a moiré fabric interior, one side of the note-pad incorporated a sash pocket in which a few business cards could be stored.. 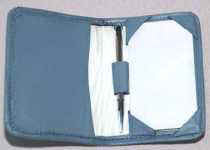 In the fold was a leather loop to hold the Cross, Sterling silver propelling pencil. 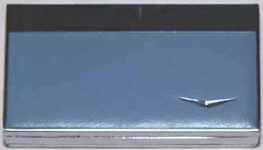 It is the regular 3½" expel/repel type by Alonso T. Cross, a pencil maker since the mid-19th century. Marked "aXt" [for Alfonso CROSS Thomas] the body is lightly engraved and has a black top with a ring through it and a black decorative band less than an inch up from the tip. It is made in USA. These pencils, or some very similar replacement items may still be found at garage sales and in antique malls. 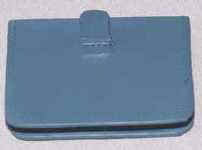 Aim for the correct 3½" model with the ring rather than the purse/pocket clip. In the last 2 years I have been able to acquire two of these Cross pencils (one with ring and one with clip). Both have been sold. 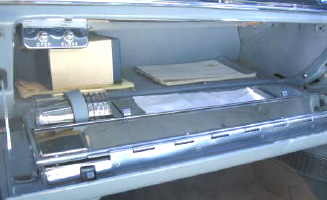 The note-pad and pencil were included in the Eldorado Brougham Parts List and could, therefore, be re-ordered from the factory. The mechanical pencil is among the easiest of the accessories to replace as these were made in the millions. Older and younger models are still plentiful. Current flea-market prices range from $15-20 for the chrome type and $25-40 for the Sterling silver version. 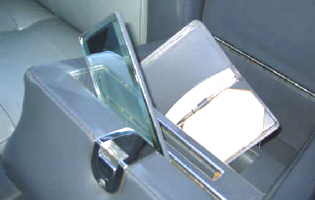 In one of the sash pockets of the rear-seat armrest was stored the rather large vanity mirror. 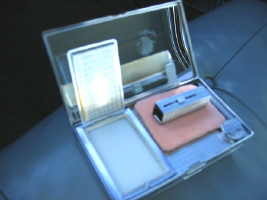 It had beveled edges and the back was covered in leather to match the car's upholstery (as were the note-pad and vanity case mentioned above). It was available in seven assorted colors: light gray, light blue, light green, beige, white, black and dark gray ...and if you lost it, you could order a spare from the factory. 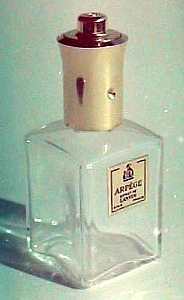 Presumably because it would be normally discarded after use, the perfume atomizer containing one ounce of Arpège perfume extract by Lanvin (Paris) is among the rarest of the Brougham personal accessories today. 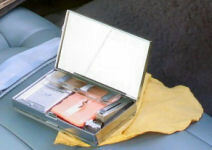 Unlike the vanity case, pad and pencil, mirror and cigarette box, the atomizer was not included in the Eldorado Brougham Parts List. The perfume and atomizer came in a small box. 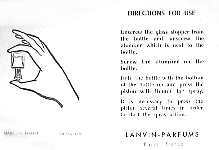 An accompanying leaflet showed the user how to assemble the atomizer top on the glass perfume bottle. 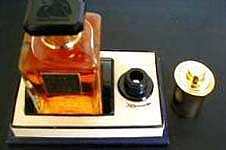 Firstly, the stopper had to be removed from the bottle; next, the atomizer top had to be screwed firmly in place (the latter had an inner plastic screw-thread); finally, the complete atomizer had to be turned upside down before pumping the piston and spraying out the perfume. 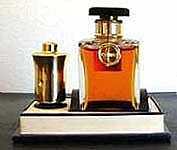 The correct perfume for the Brougham is a one ounce bottle of Arpège, extrait de Lanvin, with a gilded atomizer top. After more than a year of searching for these bottles, I would like to relate a few of the facts about the possibility of locating one. 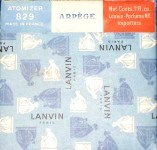 Arpège is one of several extracts produced by Lanvin Parfums of Paris, France, and during the late 1950's, Lanvin marketed Arpège in a special package including the atomizer top. 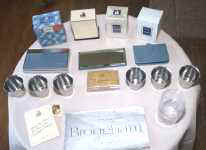 These special sets were not only put in the Brougham, but were sold over the counter along with other Lanvin perfumes. 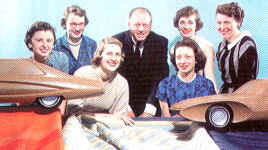 Their distribution was not as widespread in the United States as it seems to have been in Europe, but they were definitely available in this country. These atomizer sets are now extremely rare and there are three major reasons for this. First, the simple fact that they were normally discarded when empty. 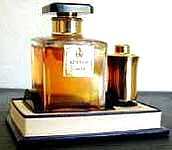 Second, the delicate nature of fine perfume limits the amount of time it will last before starting to spoil and discolor, thus old stock was always sent back to the distributor after so much shelf time. 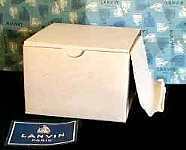 Third, Lanvin company policy dictated that when there was a change in a product line or introduction of a new line, all of the old items were immediately returned to the factory. A network of Lanvin area representatives traveled around and checked on all outlets to be sure that their stock was being kept up to date, and as a result there are virtually no collections of old bottles just sitting around unnoticed. But there is still a chance, and there are several alternatives to the real thing. 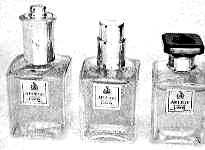 Shown in the picture (...) [see Other Arpège Bottles and Tops, below] are various one ounce Arpège bottles that you might run across in a careful search. To be 100% authentic, the Brougham requires the bottle and atomizer on the far left. [photo No ...] The next best would be the bottle with the less elaborate atomizer (second from left ...). This atomizer was also offered by Lanvin at some time during the sixties, but it has also been discontinued and become very rare. Since it is a more recent style, there is a better chance of finding this type. The third bottle is called a dummy [Fr. 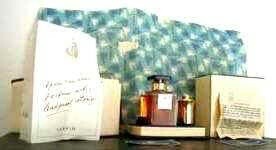 : factice] because it does not contain perfume but a liquid that looks like perfume, yet will not discolor with age. These bottles were once quite common in display cases, but have now become rather scarce because the Arpège label was changed to a new style several years ago. The bottle on the far right is the Arpège of today [seventies] with the new label, available at almost any quality pharmacy or department store for $40 per ounce. 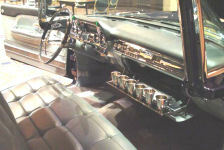 Notice that the size and shape of the bottles has not changed at all through the years, so that any of the bottles pictured will fit perfectly into the slot in the Brougham rear compartment. But the problem remains, finding the correct old style label and atomizer top. During my one year search, I have been able to turn up four bottles with old style labels and four new style atomizers. These will be made available to members who are interested in order to cover the cost of this and future research. The atomizers were found by a Lanvin representative in an old pharmacy, and the labels are from old dummy bottles that I located in Atlanta, Miami, Los Angeles and Shreveport. In all my travels and searches, I have yet to talk to anyone who has seen the correct atomizer within the last ten years [1965-1975]. From this point, I would suggest that you check the pharmacies, etc. in your area, and see if they can help. From my experience, anyone who finds the correct Brougham bottle and atomizer can consider themselves extremely fortunate, so good luck and good hunting. I have corresponded with both the New York office and the main offices in Paris, and they say their stock is absolutely depleted. 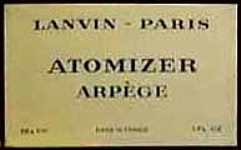 I even visited the offices of Lanvin on a trip to Paris last spring, and although they were interested and co-operative, they were unable to find any more atomizers, so all the obvious sources have been checked to no avail. The correct 1 oz. bottle of Arpège has a screw-top with decorative gold (brass) ring (above image, second from left). 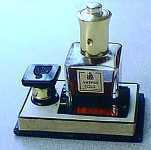 However, an acceptable compromise is the earlier type with glass stopper (image below) with gold thread around the neck; unfortunately, the atomizer top won't fit on it ...if you ever find one, hee-hee! Dimensions of atomizer top: 7/8" (top), ¾" (bottom), height 13/8"
Type 1: "LANVIN - FRANCE - BR2"
Type 3: As above, but replace "1 NY BR1" with "1 NY BR2"
Type 4: As above, but replace "1 NY BR1" with "2 NY BR"
In 1975, I too corresponded with the Paris headquarters of the Lanvin organization and was able to get from them the "last" atomizer bottle. I also contacted STEP, the manufacturer of the atomizer top to inquire if it would be possible to re-manufacture the old style top in small numbers. The price for a limited run (we have to assume that there may be no more than 100 potential buyers out there) was so prohibitive as to curb my interest in having them re-made. The local Lanvin representative in Geneva, Switzerland, was most courteous and most helpful when I inquired about the possibility of finding additional perfume bottles and atomizers. Unfortunately, his wife was killed in a traffic accident shortly after the initial contact was made and I felt that it would be in bad taste to pursue with him the matter of finding some of these old atomizers. 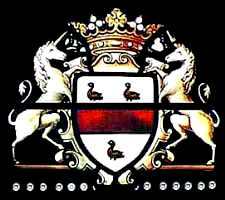 I contacted an organization in England, in 1976, called The Search and Find Agency. The latter sought these atomizers during a period of two or three months but uncovered none in the United Kingdom. 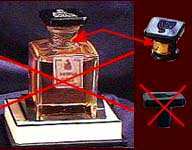 In 1997, Volker Meerkamp, a Brougham owner/admirer from Germany [volker@classiccars.de] found no fewer than THREE of the perfume bottles at a perfume-bottle fair in Germany. One of them looks like the original; it has the original Arpège label and is full of the old, dark-colored perfume ...but there is no thread for the atomizer! Instead, it has a plain, plastic stopper. 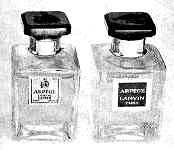 The other two appear to be Lanvin advertising samples and are so marked [VAPORISATEUR PUBLICITE = advertising atomizer]; the base of these two bottles is marked LANVIN FRANCE. 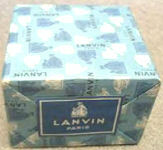 One of them carries a Mon Pêché label [ = My Sin], which is another Lanvin product. 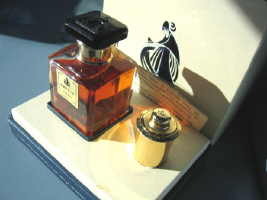 The atomizer top looks almost identical to the Arpège unit except that the top of the plunger is embossed with the letters MP [for Mon Pêché] in lieu of the usual embossed Lanvin intaglio. 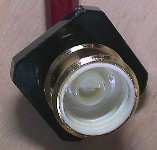 The second atomizer has an embossed P [for Publicité]; it had no label so Volker added an after-market Arpège label he got from MASTERMIND in California. Volker hopes to have photos of these bottles on-line soon. In December 1998 I received from that same collector [Michael P. Rizzuto of Mastermind Inc.] an offer to purchase a repro atomizer for $650 (actually, the introductory offer, valid for 60 days, was 10% off, i.e. $585). That is more than three times the selling price of my original - complete with bottle - in 1989; that bottle is the one used as the background image to this section - the same one I refused to sacrifice to Michael to make these reproduction copies in the early eighties. It seems that Michael is working also on a repro copy of the bottle too; at the end of his advertising flyer he says it "is half done now". From the descriptive flyer, it would appear that the repro atomizer top is better than the original: Michael says, "...the only way to distinguish our copy from the original is that ours are superior in very way!" Michael says he knows only seven people on the whole planet who possess one of the originals. My records indicate the following nine cars have the authentic and rare atomizer: #170, 210, 212, 230, 250, 351, 436, 466, 590, and 692. Cars #272 and #666 may also have one. Car #280 is known to have a repro atomizer top; the owner recently offered to buy from me one of the authentic bottles shown below. Car #211 has an atomizer but I do not know it it is an original or the Rizutto repro. Three more authentic atomizers were sold recently on e-Bay [see below]; two of these probably will soon mate up with a Brougham, so that would make 12 or 13 cars so equipped ...out of 704! The other one has gone to the Edith Piaf museum in France; Edith was a popular French singer of the forties and fifties; Arpège was her favorite perfume; to my knowledge, however, she never owned an Eldorado Brougham. 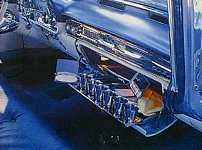 I estimate that more than half of all 1957-58 Eldorado Brougham models have survived and are restored or restorable. Of these, I am guessing that fewer than one third (i.e. 100 or so units) are or will be restored to "absolute perfection", which includes having all the original vanity items and the original owner's manual. About a dozen of these already have the original Arpège atomizer and a couple that I know have a Mastermind repro item. Of the remaining potential candidates for an atomizer, how many would be willing (or could afford?) to pay around $700 for the repro item (a trinket in Mike Rizutto's own words)? Twenty percent? I doubt it. Ten percent? Well, yes, at a push. But I think 1% is a more realistic figure. Will a dozen potential buyers - call it an income of $7000 or $8000 - suffice to cover Mike's massive investments in the Arpège atomizers over the last 7-8 years! He may well have to find another market for them, perhaps among collectors of vanity items and perfumes, to take up all the slack. Finally, I wonder how many candidates will hold out for an original, now (apparently) worth from $2000 to $3000? My continued quest for the holy grail [i.e. 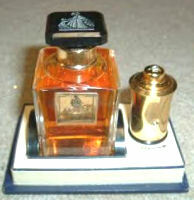 an authentic bottle, complete with the authentic atomizer top!] turned up no fewer than three of them for sale on e-Bay [Internet auction site], in 2001. 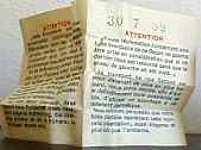 Two of them turned up in the space of two weeks, in April 2001; the third was advertised in June 2001. Two more units appeared in 2003. However, having observed their selling price, I have taken these items off my list of priorities! I now realize that there are collectors out there prepared to spend a lot MORE than me to acquire this interesting little piece of Eldorado Brougham memorabilia. including an atomizer of Lanvin's "Arpège" ! 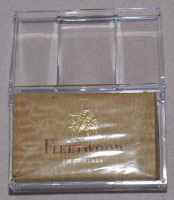 The owner of 1957 Eldorado Brougham #117 informed my in October 2010 that he had been able to aquire a few complete sets (some of them unopened) as well as some of the 1 oz perfume bottles, sans atomizer top. He wrote: I understand you might be retiring from the Database but have not heard of someone to replace you (which probably isn't possible fully!). So I thought I would send this to you and you can forward it to the correct person if needed. 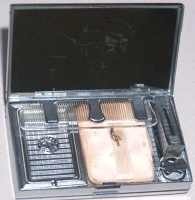 I was able to find still another original #829 perfume and atomizer set with instructions. 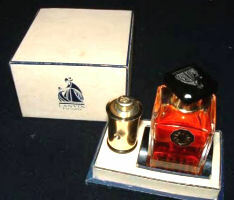 This one is also in new condition and the perfume is full. This brings my "collection" to four of the atomizer and perfume sets, two of which are unopened and still in the original wrapper. I have also eight of the #828 refills, four of which are unopened. The one on right went for over $2,100, the same month. It was Jerry Jansson (Car #284) who told me that the preceding two price records had been broken in June 2001, when another Arpège atomizer set (below) was sold (also on e-Bay) for ...$2,578.88. I just can't believe to what lengths some people will go to satisfy their collector cravings! I contacted the vendors, subsequently, to explain why the bidding on these items had gone "over the moon". None of them had any idea that these "ordinary" perfume items were directly related to one of America's premier collectible automobiles. These vendors were able to multiply their investment by 100! sold in October, 2003 for over $2,300 - where will it end ? where it was listed for ... $7,000.00 !!! He got $10,000 for it ! The same vendor put a second unit up for sale on eBay in June, 2006, with the same image [above, left]. Here's what he said about it: this auction is for one of the rarest things you will ever see. This is the holy grail of car accessories. 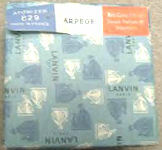 It the LANVIN arpege ATOMIZER set for the 1957 Cadillac Eldorado Brouham. 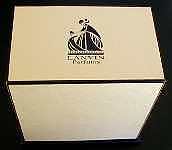 This set has never been opened, and the wrapper, box, and obviously the contents, are in MINT condition. This is the ultimate! I have pictured the sealed set you are bidding on, and one that I sold in the past (opened) which you are not bidding on, but just so you see what the set inside looks like. they both came from the same source and I guarantee authenticity with my life. This bottle is the type "3" bottle [from my descriptions, above], which is one of the 4 original bottles, and I guarantee that! This is the LAST time you will have a chance to own this item. He wants ...$60,000 for it ! in 1957, for $50, surely someone out there is daft enough to pay those 60 grand! THREE items for just ...$9.99 ! This set could have beaten all previous records ! 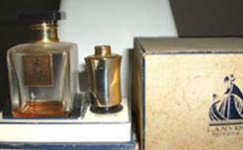 Right: in March 2006, the "Arpège" perfume bottle and atomizer top alone (right) were listed for $7,000 !!! Late extra: bidding topped out at $5,151 ...but that wasn't enough for the vendor ! appeared on eBay in April, 2006 with a starting bid of $99. the final selling price was an "astronomical" $6,400! did he acquire that one merely to complete one of these two sets? Several individuals have, at one time or another offered reproduction personal accessories for sale ...usually at very high prices. 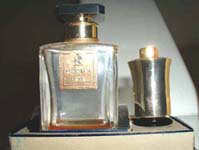 One collector, Mike Rizutto, said he could reproduce the Arpège perfume atomizer if someone would lend him an original unit to serve as a model. 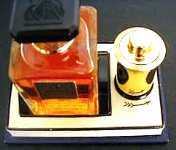 I hesitated to allow my own, original atomizer to be put to this use because there was no guarantee it would not be damaged or possibly even destroyed in the copying process [in 1991, when I gave up trying to find my dream Brougham, I sold my atomizer to Roger Zimmermann, owner of Brougham #230, in Bienne, Switzerland]. 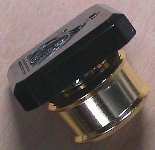 These replica atomizers are currently being made by Mastermind in CA [1999-2001]. Other replica vanities are also available from this source. But does it really matter anyway, if the glove compartment and rear seat armrest contain the original personal accessories that were delivered with the Brougham? 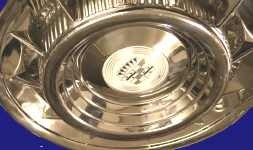 What would be the position of today's Brougham collectors if Cadillac had delivered each one of them with a couple of pounds of fresh prawns and a small jar of caviar, instead of one ounce of Arpège perfume in a fancy atomizer? 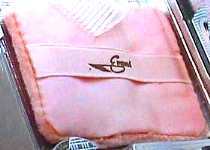 Would they still insist on having aboard the original prawns and the original caviar? 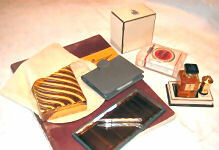 Trivia : There is an interesting article on the personal accessories in SSA, 30th anniversary issue (p.46). 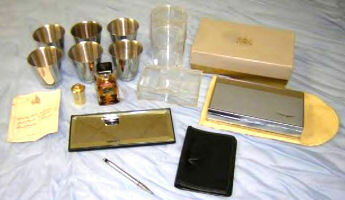 On the topic of the personal accessories in general, in a letter from Cy Strickler in the spring of 1976, he said that there were absolutely no vanity items anywhere that he knew of. In 1986, I saw an ad in one of the major American hobby magazines advertising a full set of the Brougham personal accessories for ...$2500! That is about what a complete Eldorado Brougham in very good condition cost in the early seventies! Not before 2002 did I see any Brougham vanities offered again as a "set". In February that year, an INCOMPLETE set [i.e. 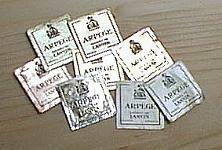 without the Arpège perfume atomizer!] in good (but not mint) condition was offered on E-Bay, the Internet auction site. The bidding started at $100 and leveled off at $2700 about five days before the auction ended. In the last 5 minutes, however, the bidding climbed sharply from $2700 to close at an incredible $4250! Interestingly, the successful, high bidder was not among the bidders until the very last minute. I say the world has gone mad! In my opinion (or have I seriously lost touch with reality! 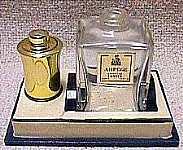 ), that set which, as I said, did NOT include the most valuable of all the accessories - the essential Arpège atomizer - was worth only around $1,500-$2,000. Late Extra (Feb. 2002): I was contacted by the successful bidder who, it turns out, is actually a friend and an Eldorado Brougham owner (in fact we belong to the same regional chapter of the CLC). Tom went into a long explanation why he is convinced that he got these accessories at a "good price". Adding to this incomplete set the missing perfume atomizer, at its the current market value of circa $2,500, would put the complete set of "vanity items" at around $6,500-$7,000. Tom, therefore, seems to believe that the vanity items to represent about 20-25% of the total value of a complete car in good to fine condition [these sell typically today for between $25,000-$40,000]. Again in my opinion, this seems a bit unrealistic. But that is only my view as someone not in the market for one of these cars. To try put a more realistic perspective on things, we owned a rare, four-door Cadillac. It was a 1942 Series 75 limousine, Fleetwood style 7519-F, of which only 65 were built that year; that is 84% fewer cars than the already "rare" 1957 Eldorado Brougham. 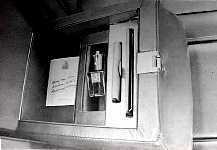 Only four survivors have been located to date (2005), which represents a survival rate of 3% compared to 61% for the 1957-58 Broughams (by the way, one of the four 7519-F survivors has a non-authentic ...red velour interior!) It would follow, therefore, that our former car is MUCH rarer than any 1957-58 Eldorado Brougham model, of which there are about 430 known survivors. Our car too was delivered (more than sixty years ago!) 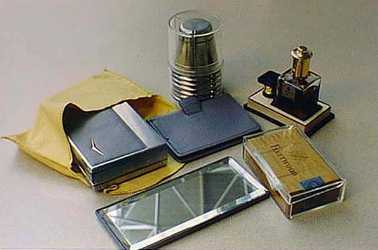 with two interesting "vanity" items: (1) a small notepad in the RH, rear armrest smoking set, and (2) a small hand mirror in the LH, rear armrest smoking set. Sadly, these items were missing in our car. Considering the current rated value of a 1942 Fleetwood style 7519-F to be circa $20,000, does that make these missing trinkets worth $4000-$5000? I don't think so! The MOST I would be prepared to pay for them is about $100-150 each! Methinks there has to be a limit to what a rational individual will spend for such "ordinary artifacts". Now I'm not saying that Tom is being "irrational"; he's just being slightly less rational than me! 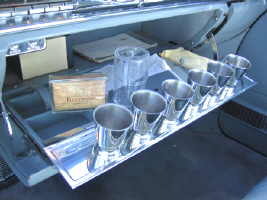 Except perhaps for the magnetized drinking cups (that I have not seen elsewhere than in the Brougham), these trinkets were not exclusive to that car, nor were the smaller notepad and mirror exclusive to our 1942 Fleetwood limousine. 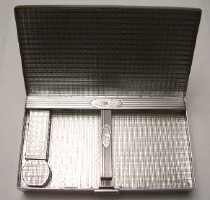 The compact is one of many double-sided compact designs by Evans, from the fifties and sixties; the plastic cigarette box, the notepad and the silver Cross pencil all are relatively common items; the mirror, like the compact, probably was mass-produced with different designs and materials on the reverse. 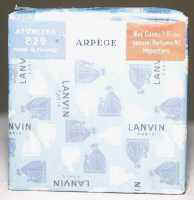 The Arpège gift set by Lanvin of Paris never was exclusive to the Eldorado Brougham. 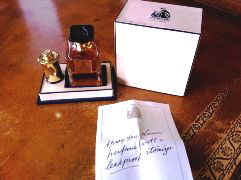 Lanvin also offered identical atomizer sets for their Scandal and My Sin perfume extracts (only the labels differ). I could not end this chapter without reporting yet another record-breaking sale of an Eldorado Brougham accessory which merely serves to confirm that, yes, collectors of such memorabilia indeed are a breed apart! 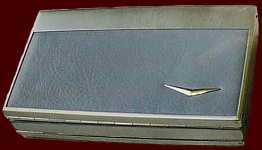 Having witnessed in the last three years (2002-2005) what some 1957-58 Eldorado Brougham vanity items could fetch at auction, I decided to "test the waters" and to advertise for sale by auction my own 1960 Eldorado Brougham owner's manual. Note that of the 49 known surviving cars, only two are believed to carry that manual, so I knew I was addressing a very narrow group of some 45 potential owner-buyers (excluding collectors of auto literature and the like). The item was on the e-Bay Web site for seven days and did not garner a single bid ...until about two hours before closing time. The higher of only two bids came in just six seconds before the auction ended. The high bidder spent $2000 so that his 1960 Eldorado Brougham would be complete "down to the last detail". front grllle for the 1958-58 models sold on Ebay, in July 2008, for a record ...$10,000 ! $50 ...short of $6,000 ! 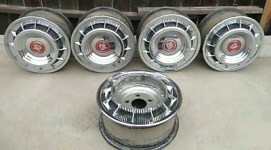 cheap at the price considering the kind of money being asked for the preceding wheel covers alone! together, the two items (bracket & frame) sold in March 2009 for $3,000 ! this UNIQUE opportunity to buy it for "only" ... $100,000 !!! And finally: Some things you don't get to see every day ! A unique "stash" of vanity items for the Eldorado Brougham - 3 full sets ! You can twist my arm all you want - I won't tell ! For the 1957-58 Eldorado Brougham owners interested in the elusive Arpège atomizer, here is a fun excerpt from a 50's TV show aired in the USA, called You Bet Your Life, hosted by an aging Groucho Marx who, despite a wrinkle or two, definitely hadn't lost any of his dry wit. 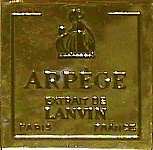 Believe it or not, the topic of the sketch is Lanvin's Arpège perfume. Announcer: Groucho, Miss Broadwick and Mr. Edouard Cornand are willing to talk to you. So folks, if you would come in please and meet ...Groucho Marx. Groucho: Say the secret word and you'll divide 101 dollars. It's a common word, something you see every day. Uh, Mister Cornand, I suppose that's you. What's your first name ? Edouard; I'll just call you Eddy, huh? Where are you from, Eddy, Kokomo or Kalamazoo? "Eddy" Cornand: I'm from Paris. Mr. Cornand: No, Paris, in France. Groucho: 1923? You got here before the Pilgrims did! (laughter). Now, Mr. Cornand, what brought you to Los Angeles; and don't say "a train". Because that's an old joke and we've had enough old jokes on the show tonight. Mr. Cornand: I'm in the perfume business; I'm the president of Lanvin. Groucho: President of the what? 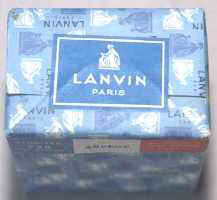 Mr. Cornand: Lanvin perfumes (now uses the French pronunciation). Groucho: I don't use perfume myself, I just rub my body with Ham's Beer (laughter). Whaddaya call your perfume, maybe I can get some clue from that. Mr. Cornand: The best known are Arpège and My Sin. Groucho: Well, thats a good one, alright. That's a knee slapper if I ever heard one. Boy, I'm gonna tell that to the boys at the club tomorrow, that'll kill 'em. Or vice versa. Is your perfume expensive, Eddy; if it is, that's why I haven't heard of it. How much do you charge for a gallon of this stuff? Or can you buy it on draft? Mr. Cornand: (...) The price runs from 3 dollars for (? personal size Arpège?) up to 500 $ for 32 ounces (this is a quart, right?) ...and this excludes 10% taxes! Groucho: Are there really any husbands who are willing to shell out $500 for a bottle of perfume for their wife? Groucho: Well, you don't have to explain, monsieur, I've been around. I'll bet you certainly look forward to Mother's Day, huh?